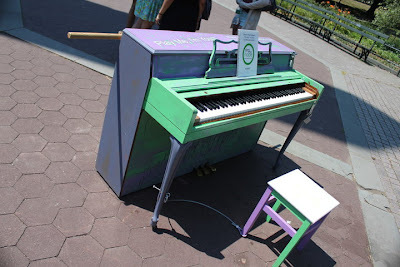 Throughout New York City, for 2 weeks, pianos were set up around the city for the public to come and play & tap some keys. It was part of Sing for Hope's art project. There were 60 pianos in total, spread out in parks & public places within the 5 boroughs of New York. They support the arts & believe it is an agent for social change. My friend, Freida, wanted to celebrate her belated birthday by visiting one of them to play for awhile. The only chance we got was the last day of this art project (which was this past Monday). We went to the one right behind the Metropolitan Museum of Art. She played beautifully & even gathered a crowd in to watch, despite the heat! Now that is awesome!! Sometimes I wish I lived in New York City instead of the suburbs because I missed out on seeing the pianos!! I would have sat in Little Italy & played the Godfather theme! hehe =) Happy belated birthday to Frieda! That's a really good idea !! 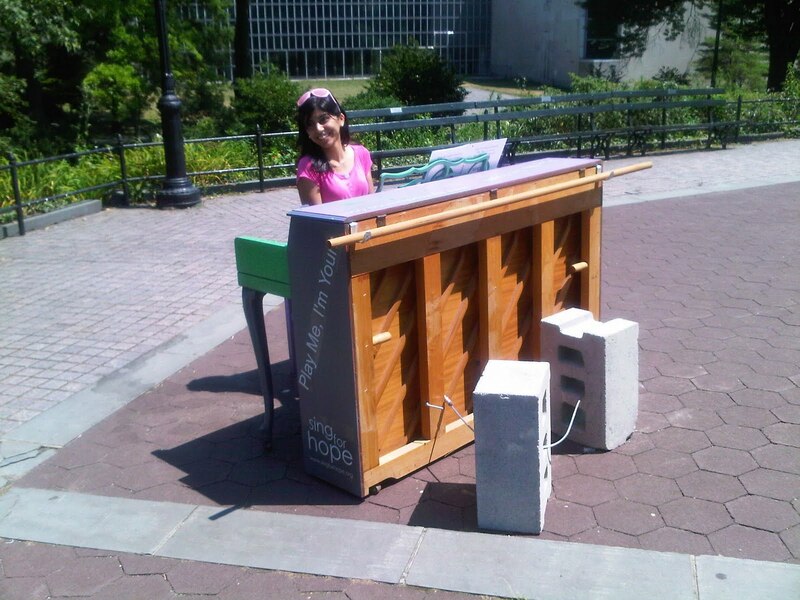 Yes, I saw one of these pianos last week in Astor Place. I had no idea what they were for! 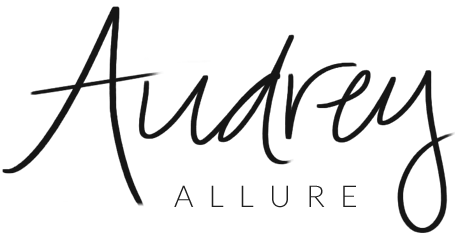 Such a great project. Long live the arts and music! Such a great idea! So many schools are losing their music programs, it's sad! What an inspired idea! Wish I lived someone so creative and inspiring. I love it!! what a great idea!! I'm excited to be getting my first view of NYC in less than a week for Blogher. Will you be there? Cool pianos! I'm currently learning to play Lean on Me on my piano. oh that's very cool, and what a great cause! Such a lovely idea. I wish I knew how to play. that is really cool, it would have also been a good idea if they would have recorded everyone who played! i love your song of the day! What a great project! Love the idea! I play the piano so I would have been all over this. Glad your friend got a chance to play! I love the idea of having artists/musicians and amateurs alike on the same "stage". It's just lovely. oh reminds me of when I played the piano in my younger years! that's an awesome cause. i miss living in a city. very cool. don't feed the models. part 2.
the pianos look so adorable! and i remember when they did something like this in london :) it was such a lovely atmosphere! Such a fantastic idea...I love it so much!!! wow, this is an amazing idea! Gee, I wish I'd heard about this project before, it's been a while since I last played the piano:) Beautiful pictures, btw! That's awesome. It makes me want to practice more. i love that first piano! I wish I could play the piano. THese look so amazing. Seriously great idea! 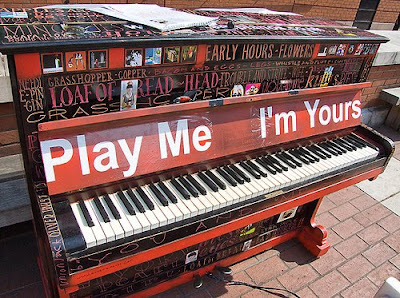 I would have loved to have been in NYC and played at one of these pianos! what an inspiring idea! why no one is organizing something like that in my country? This is awesome! I love love love the first one. I think it's time for DIY your piano time, haha. :D + Thanks for the sweet comment, your a real doll! I hope you've had a great week. I certainly have. Thanks for your comment on my Taylor Lautner post. I appreciate it. I got so many wonderful comments on that post. Enjoy the upcoming weekend.